Mr. Fresco was a guest lecturer at many institutions of higher learning. He addressed students at the University of Miami, Princeton, University of Southern California, Dade Junior College, Queens College, Presbyterian College, University of Southern Florida, Nichols College, Columbia University, Instituto Tecnologico de Estudios Superiores de Monterrey in Monterrey of Mexico, Institute of Technology in Vienna, Austria, Penn State Greater Allegheny, Nova Southeastern University, City London University, University of Michigan, and others. He and Ralph Nader were featured guest lecturers at the University of South Florida. At Princeton University, Mr. Fresco addressed the Department of Sociology. His subject was Sociology of the Future. Along with the well-known anthropologist Margaret Mead, Mr. Fresco was extended an invitation to address the College Environment Conference in Washington, DC. He was a guest speaker for the Tenth Symposium for the Civil Engineering Department of TEC de Monterrey University in Monterrey, Mexico, Latin America’s top rated college. Mr. Fresco was a guest speaker at The Utopian Studies Conference in Orlando, FL and lectured at several World Future Society Conferences. He was also guest speaker at a conference in Iceland and the guest of honor at The Futurists Summit 2008 in Istanbul, Turkey, as well as many other conferences, such as the Futurist Convention, Global Sciences Conference, the Future By Design’s Transitions ’96 Conference, and the Global Cleansweep and Solarsweep forum in Florida. He was a guest lecturer on future planning in Dubai, United Arab Emirates, at the Technical University in Vienna, and at the conference at Dalian, China for the Development of N.E. China, as well as a conference at Abuja in Nigeria for the revitalization of its informal sector. Over the years, Mr. Fresco has also delivered lectures to numerous civic groups and various other organizations, such as B’nai B’rith of Los Angeles (CA) and Miami (FL), Mensa of Los Angeles, the Los Angeles Science Fantasy Society, the Humanist Society, the Center for the Study of Democratic Institutions in Santa Barbara (CA), the Spinoza Outdoor Forum of Miami (FL), Unitarian Universalist Church in Daytona (FL), and others. In recent years, he delivered lectures at COP Kreativ, Copenhagen, Denmark; City London University, London, UK; and El Salvador, San Salvador. He was awarded the 2009 International Design Award from a! Diseño and lectured at their Life Loves Design conference in Ixtapa, Mexico. In 2009 and 2010 Fresco addressed supporters at the annual Z-Day event in New York. In 2010, he began a World Lecture Tour in which he presented over 26 lectures in 20 countries. It was very well received. In 2011, Mr. Fresco addressed the public for Occupy Miami at Government Center in Miami. In 2012, he was honored at Sustainatopia in Miami. In September 2012, Fresco addressed supporters in Banja Luka, Bosnia, and the Galactic Citizenship Conference in St. Petersburg, Russia. He also addressed the audience at the New Jack City Festival. In July 2016, less than a year before his death, the United Nations bestowed an award for City Design & Community. In early 2017, Florida’s Baker Museum of Artis—Naples honored Fresco’s life by featuring a five-month exhibit called “Jacque Fresco: 100 Years of Vision” consisting of a timeline chronicling Fresco’s life and work, curated by Silvia Perea. We have all heard lectures that downgrade the present state of affairs. They speak of such social problems as lawlessness, poverty, racial tension and divorce. But how many of us can recall any of these lectures offering creative solutions to these problems? Mr. Fresco’s presentations reflect a serious attempt to illuminate the causes and outline a wide range of constructive alternatives. He did this by presenting a redesign of our culture, one that would emphasize the intelligent use of science and technology to enhance the lives of all people while protecting our environment. His subjects range from “New Dimensions in Human Stupidity” to “Imagineering The Future.” A video often accompanies the lectures where his ideas are vividly brought to life through animated models, illustrations and computer animation. His particular lecture technique enables uninformed audiences to grasp the significance of complex social and technical issues through his use of analogy, example, and anecdote. He speaks dramatically and passionately about the urgent transitional problems facing our contemporary society. His audiences find their attention focused closely on the words of Mr. Fresco from brilliant beginning to profound end. Mr. Fresco’s lectures have consistently been received with praise and enthusiasm. 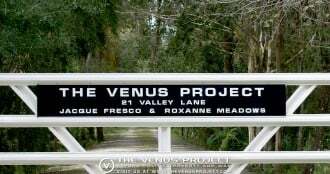 Mr. Fresco was the founder of Sociocyberneering, Inc., now known as the Venus Project. With his associate Roxanne Meadows, he designed and built the entire twenty-five acre research facility. The function of this project is to prepare approaches and solutions to the major problems that confront the world today. Television, newspaper, and magazine coverage on the project has been worldwide. Jacque Fresco died on May 18th, 2017. Today, Roxanne Meadows directs The Venus Project. She is available for lectures. For more information, contact her. Technical Consultant to the Motion Picture Industry, including technical advisor and effects creator for the film Project Moonbase (1953) written by Robert A. Heinlein; for Encyclopaedia Britannica Films for Joe Stoneman Productions; and for Camera Eye Pictures, Inc., for the film, The Naked Eye (1956), which won the Robert J. Flaherty Award for creative film documentary and was nominated for an Academy Award. Colleague and work associate of Donald Powell Wilson of Los Angeles, the noted psychologist who wrote My Six Convicts. Designing the Future, (2007) The Venus Project, Inc. The Venus Project: The Redesign of a Culture (1994) – produced, directed, and edited with Roxanne Meadows. Welcome To The Future (2001) [Trailer | Deluxe] – produced, directed, and edited with Roxanne Meadows. Cities In The Sea (2002) [Trailer | Deluxe] – produced, directed, and edited with Roxanne Meadows. Self-erecting Structures (2002) [Trailer | Deluxe] – produced, directed, and edited with Roxanne Meadows. Designing the Future (2006) – produced, directed, and edited with Roxanne Meadows. Paradise or Oblivion (2012) [Trailer | Full | Deluxe] – produced, directed, and edited with Roxanne Meadows. A major documentary entitled Future By Design, produced by Academy Award nominated and Emmy Award winning filmmaker, William Gazecki, was released in 2006 and outlined the life, designs, and philosophy of Mr. Fresco. The film Zeitgeist: Addendum featuring Mr. Fresco and The Venus Project produced by Musician and Film Maker Peter Joseph was released in 2008. A sequel to this film, Zeitgeist: Moving Forward, was produced in 2011 featuring Mr. Fresco’s aims and directions. The documentary Paradise or Oblivion, produced by Roxanne Meadows, introduces the culmination of Jacque Fresco’s work, and viable solutions for the future. The Choice is Ours (2016) produced and directed by Roxanne Meadows and Joel Holt delves into how we acquire our behaviors and values, the environment that influences them today and the possibilities of a social system arrived at by Jacque Fresco which is designed to bring out the best in the human potential. Many of these projects have been patented and have had wide commercial acceptance. Feature article, Designing the Future: A Cybernetic City for the Next Century in the 1994 May – June issue of the World Future Society’s magazine, The Futurist, where the editors compared his work with R. Buckminster Fuller and Paolo Soleri. Jacque Fresco has been seen in several films on several television channels, such as: FreeSpeechTV, ORF1, SVT, NRK, YLE, AVRO, SBS, DR, RTE, Al-Jazeera, Channel 8 Noga Communications Israel, AB Groupe, DCCV TV, Czech Television, Metropolis Television Inc Taiwan, ERT Digital Greece,Kultura TV Russia, Starz, Discovery, and others. He has also been seen in many film festivals, such as: Dokumentarfilmsalon, Festival Film Dokumenter (FFD), Cromarty Film Fest, Image Nation 26 Vox Feminae Fest, Cork Film Fest, Jihlava International, Kinofestival 360, Flimmer Film Fest, Reykjavik Film Fest, Filmfest Hamburg, Prizren Dokufest, Liverpool Pride, Galway Film Fleadh, Frameline, UK Green Film Fest, Gdansk Doc Film Fest, Torino Cinemambiente, Planete+ Doc, Ambulante, Doxa, IFF Boston, Hot Docs, Värmlands Filmfestival, AARHUS Film Fest, BFI London Lesbian and Gay Film Fest, Tempo Documentary Fest, ZagrebDox, Göteborg International Film Festival, RSA London, Crossing the Line, Tallinn Black Nights Film Fest, CPH:DOX, Edinburgh International, Jam Fest Indie, Yosemite Film Fest, Action on Film, Wild Rose Film Fest, Nevada Film Fest, Los Angeles Movie Awards, Image Gazer Film Fest, La Arthouse Film Fest, Docutah International, Clearwater Film and Music Fest, Brantford Film Fest, Marbella International, Crystal Palace International, Grand Rapids Film Fest, Cinefuturo, Maryland International, Salt Lake City Film Fest, Radar Hamburg International, Artivist’s Film Festival, du Film sur l’Art International, Visions 9th International, AIA Colorado, Palazzo delle Arti Napoli, Ecofilms, Architect Africa, Attitudes, Artecinema, dei Popoli, Australian International, Fantasy Worldwide Film Fest, India World Peace Film and Music Fest, RIOFAN Film Fest, Conscious Life Film Fest, Rwanda Film Fest, Maui Film Fest, Sedona International, Carolina Film and Video Fest, London International Festival of Science Fiction and Fantastic Film, Rebelfest International, Atlanta Film Fest, Calgary International, Hope and Dreams Film Fest, Sao Paulo International, Guangzhou International and others.